The first type of card I typically focus on after Christmas is thank you. I made this one inspired by the mood board for the current Pin-Sights challenge at Ellen Hutson's CLASSroom blog. The things that stood out to me were the overall colors & the wood paneling in one of the photos. I began by die cutting several flowers & leaves, a seed pod, and berries from "Wild Garden" & "Bold Blossoms," both from the Essentials by Ellen line. I used Canson XL Mixed Media paper, since I knew I would be watercoloring the images, but still wanted a thinner paper than regular watercolor paper. After I die cut each piece, I applied Frog Tape to the back side of the paper, before removing it from the die. Then I carefully pulled it out of the die. The Frog Tape helped keep all the little inner pieces in place so I wouldn't lose them. I'm not sure if there is an easier way to do this, but it worked for me. I did initially try dryer sheets, but the die cuts didn't stick to those for some reason. With the die cuts still on the pieces of tape, I watercolored them with Distress inks & a water brush. I used Crushed Olive, Peeled Paint, & a bit of Forest Moss on the greenery; and Abandoned Coral & Barn Door on the flowers. For the berries, I colored the tips with a red marker, and used my water brush to blend the color into the stems a bit, then finished with diluted Brushed Corduroy Distress ink for the stems. Then I set those aside to dry completely. I cut another piece of mixed media paper for my background, to A2 size. I stamped the entire panel with the "Wood Plank" background stamp by My Favorite Things, with Hero Arts Wet Cement ink. Then I blended Brushed Corduroy over the panel. Next I die cut the "Thanks Script" from Savvy Stamps (discontinued) from the panel. I used the same process to remove the die cut pieces as I had with the flowers. Since I wanted to do a die cut inlay, I needed the inside pieces to the letters. I also die cut the "thanks" from some dark green cardstock that I'd backed with Stick It adhesive. After my flowers & foliage had all dried, I removed the outline pieces from the tape, and ran each through my Xyron Sticker Maker. I adhered those in place on my background panel, and then used Perfect Paper Adhesive to glue all the little inside pieces in. After the glue dried, I trimmed off the excess that was hanging over the edges, and adhered my panel to a white A2 card base. I added a little glue behind the bits of the background panel around the thanks opening, to help them stick down better. Then I adhered my die cut greeting, fitting it into the opening like a puzzle piece. Finally, I used more PPA to glue the inner/background pieces into the "h," "k," & "s." This was a bit of a labor-intensive card, but so worth it in the end! 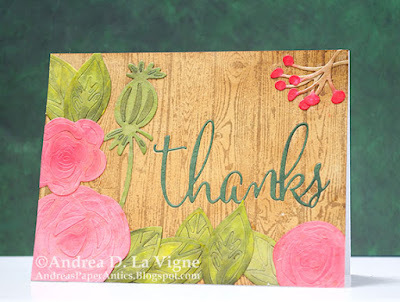 Simon Says Stamp's Wednesday: "Anything Goes"
Pile It On #123: "Any Holiday/Celebration"
Creative Knockouts #174: "Anything Goes"
Your flower dies look lovely against the woodgrain background, Andrea! Thanks for playing again with us at the Simon Says Stamp Wednesday challenge!